I am always a big fan of science and technology, especially in things that move such as jet plane, air craft carrier and space shuttle. They are the vivid examples of what man can achieve and how our life can be changed with the advancement of technology. 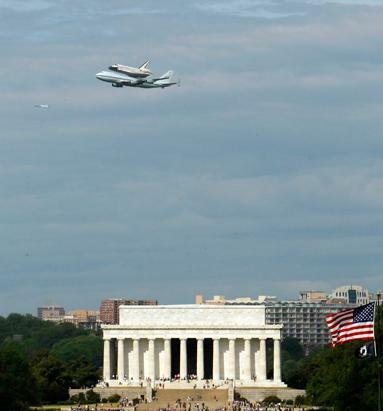 When I first knew about space shuttle Discovery was going to fly historically over Washington D.C. – I made up my mind to go. I took the metro early in the morning to Crystal City station – and walked on this trail to Gravelly Point, the best spot to see air planes taking off and landing at Washington Ronald Reagan National Airport. It was suggested as one of the nicest places to see space shuttle Discovery. Discovery, NASA’s oldest surviving orbiter, blasted off on its maiden voyage on August 30, 1984. It ultimately flew 39 missions, covering 148 million miles and 5,830 orbits, logging a cumulative 365 days in space, and carrying 246 crew members into orbit. Bolted to the back of a 747, the space shuttle Discovery took its last spin in the air and coming to my direction. Discovery is the world’s most traveled spaceship and its list of achievements include delivering the Hubble Space Telescope to orbit, carrying the first Russian cosmonaut to launch on a U.S. spaceship, performing the first rendezvous with the Russian space station Mir with the first female shuttle pilot in the cockpit, returning Mercury astronaut John Glenn to orbit, and bringing shuttle flights back to life after the Challenger and Columbia accidents. It flew right above me and hundreds of crowd cheered along. It was a spectacular and amazing sight! Discovery, the fleet leader of NASA’s three surviving shuttles, completed its last spaceflight in March 2011. It was promised to the Smithsonian Institution’s National Air and Space Museum in Washington, the nation’s official repository for space artifacts. Gravelly Point and Reagan National Airport at the background. Everyone stopped just for this moment. NBC was reporting live at the vicinity. Discovery, which first flew in August 1984, was to be transferred to the Smithsonian’s nearby Steven F. Udvar-Hazy Center in Chantilly, Virginia. For at least the next three to five years – until commercial passenger craft are available in the United States – NASA astronauts will have to hitch multimillion-dollar rides on Russian Soyuz capsules to get to the International Space Station. And the debate continues on the NASA budget cut -and whether Russian or Chinese will overtake the U.S. in the space exploration. Friday morning at Foggy Bottom Metro Station, Washington D.C. Walking is my favorite habit in the U.S.
It’s so powerful as you walk – you observe the surrounding, study the people and think critically. A ray of sunshine and a balmy breeze warm your heart with love. Life is full of possibilities. I read a few great quotations about challenges today – and would like to share them with you. May you have enough happiness to make you sweet, enough trials to make you strong, enough sorrow to keep you human, and enough hope to bring you joy.